I had some time to look over some loooooong range computer model data and make a few observations of what could come between October 28 - November 26 to central Indiana and the Midwest. One thing to remember, you should take all of the thoughts with a MAJOR grain of salt. This is only one computer model's view over a long period of time and not reality. You should not get too hung up on details. Things can and likely will change. Data suggests 5 of these upper-level storms affecting the Midwest November 2, 8, 10, 19 and 22. Temperatures in the Midwest turn warmer November 3-7. We have a period of above normal temperatures in the Central United States November 12-18. 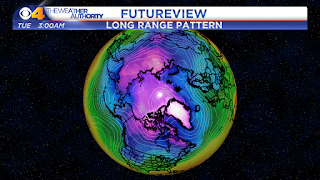 Indiana could see above normal temperatures November 14-21. Colder air arrives in Great Lakes (including Indiana) November 23-24. Above normal temperatures in Indiana November 25-26. Keep in mind, the model is just that. A computer model. The farther out the model looks, the higher the possible error rate. The key to look at this kind of data is not to look at specifics but instead trends and long wave patterns.